A mouth guard is a protective covering for teeth to prevent teeth grinding and damage and injury to gums. Smile Denture Implant Clinic provides is happy to provide custom athletic mouth guards in a variety of sizes and colours. A dental teeth guard fits over your upper or lower teeth and will prevent teeth grinding. As it is made with soft plastic, dental mouth guard can easily be adapted and changed to fit your unique mouth size. Remedying a lost tooth with dental treatments over your lifetime can be expensive. Mouth guards can protect you from losing teeth and save you money. 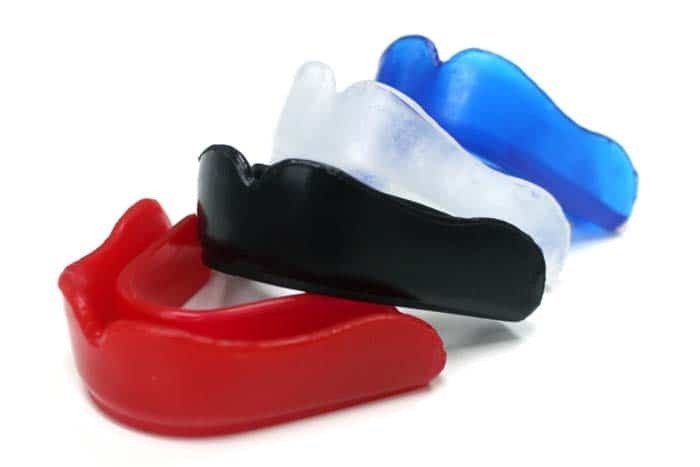 When it comes to sports equipment, teeth guards are a priority. Good fitted teeth guard can protect your teeth, lips, cheeks, and tongue. Concussions and jaw fractures are also prevented with the proper use of a mouth guard. At our Ottawa denture clinic, we make our custom mouth guards by taking an impression of your teeth. Then we mould a teeth guard over a model using special material. As a result, a custom mouth guard will have superior fit and comfort. While many think of hockey and football as the most dangerous sports for your teeth, almost half of sports-related mouth injuries occur during baseball and basketball. How does one choose a dental guard? It is important to get a mouth guard that fits comfortably over your teeth. Although any dental guard is better than no mouth guard, make sure it does not interfere with your breathing or speech. To ensure your teeth guard fits as it should for optimal protection, consult our Ottawa denturist Caner Karaceper. Smile Denture Implant Clinic is happy to offer affordable mouth guards in Ottawa with competitive cost. We fabricate our teeth guards in house at out Ottawa Smile Lab. This allows us to give you the best priced mouth guards compared to most dental clinics in Ottawa. No matter what your age, the sport you play, or the exercise routine, a teeth guard is important for your oral safety. Be sure to protect your smile and preserve your health with our quality mouth guards. Let Smile Denture Implant Clinic in Ottawa ensure your teeth are properly protected. We will only take a few hours to craft your perfectly fitted and customized mouth guard for you. Call us today at 613.262.6332 to book your free, no obligation appointment. To see the full list of dental services we offer, please visit our services page.